Hi all! 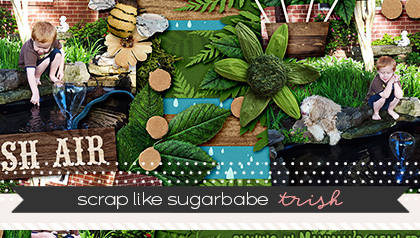 I am going to walk you through a simple process to turn your completed scrapbook page layout (LO) into a Quick Page (QP). 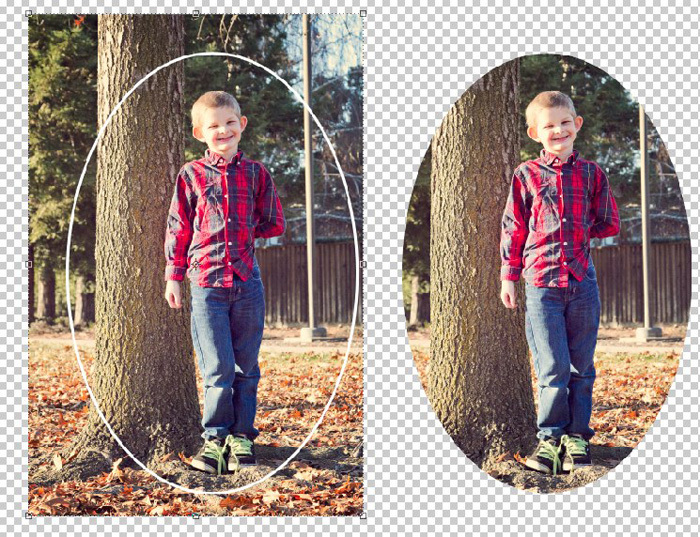 This method will save all your shadows and also allow you to save any elements that were layered on top of your photos. 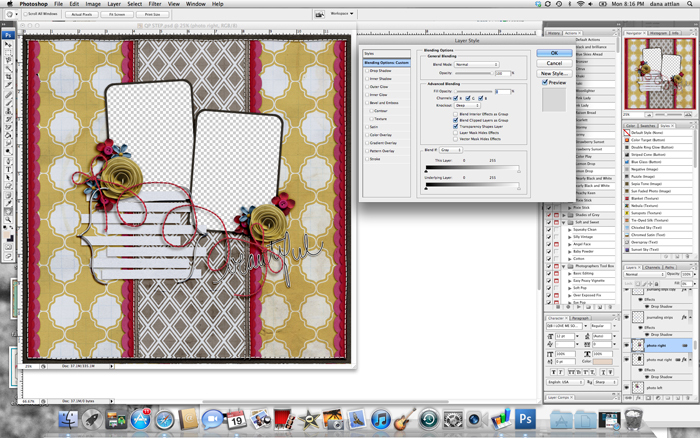 I created this tutorial using PS CS3 on a Mac. However, you should hopefully be able to replicate the steps using the corresponding commands on your own computer and scrapbooking software. 1. Open the layered, completed LO that you want to convert into a QP and rename it so that you will not make any unwanted changes to your original LO. 2. 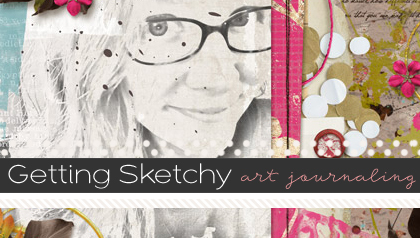 Delete any journalling that you have on the page. 3. 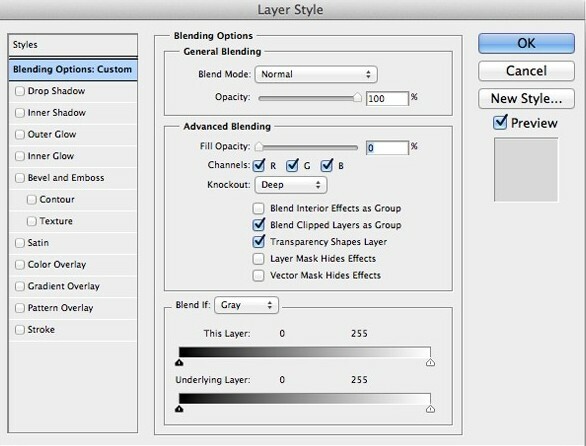 Select your bottom most photo layer and double click on it in the layers palette to bring up the Layer Style Dialogue Box. 4. Set the knockout to “Deep” and the Fill Opacity to 0%. You now have a layer that retains it’s shadow, stroke, and other layer styles while “knocking out” the visibility of anything below it AND remaining moveable. 5. 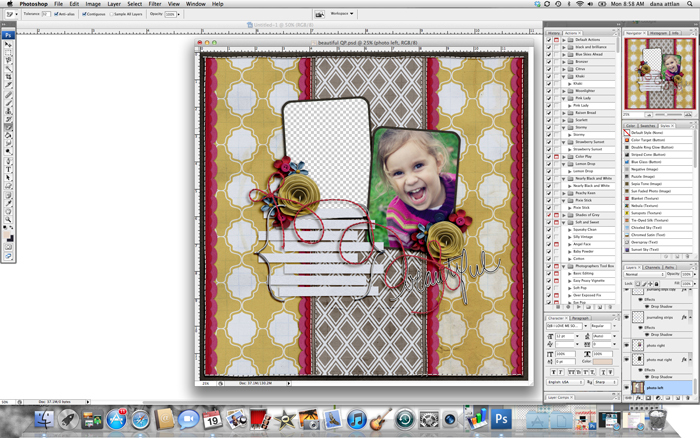 Repeat for the other photos on the layout. 6. 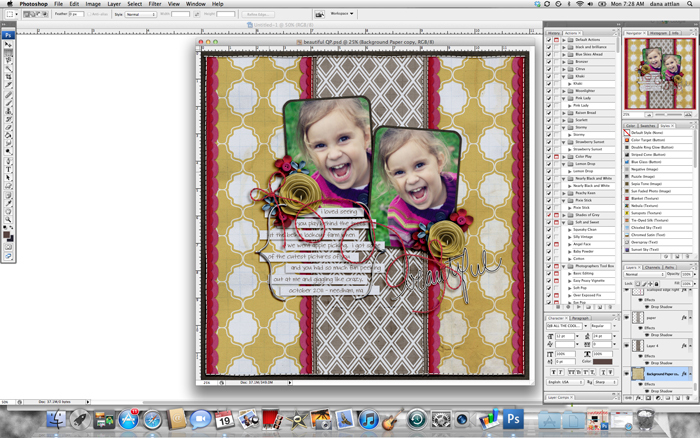 Merge layers and save as a .png file! 3. 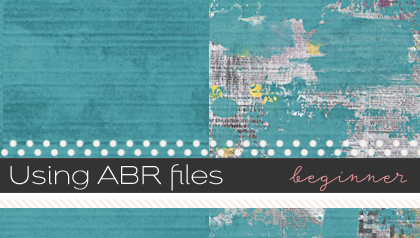 Find the photo layer that is closest to the bottom layer and fill it with a color that is NOT found elsewhere in your LO. I did this using the “New Fill Layer – Solid Color” command in the Layers palette and then using the “Create Clipping Mask” command (also in the Layers palette). 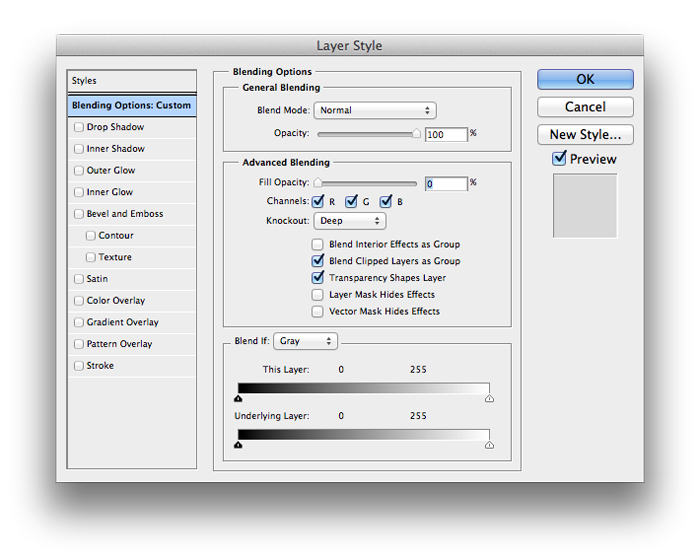 TIP: Do not use black or grey when creating the colored layer as this will cause you to lose your shadowing. 4. Merge your Fill Layer with the Photo Layer so that the original photo is gone and you only have the colored layer. 5. Select the bottom layer up to the filled photo layer (from Steps 2 & 3), selecting all the layers in between. 6. 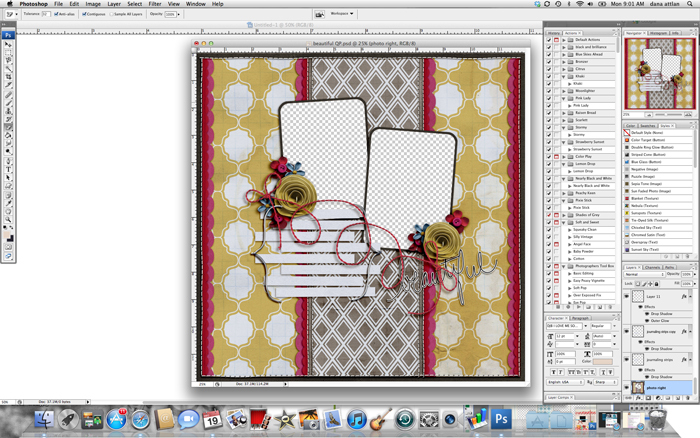 Merge the selected layers together. I did this using the “Merge Layers” command in the Layers palette. 7. Click on the “Magic Eraser” tool and delete the colored photo spot. This will erase the original photo spot but will not erase any shadows or elements above the photo spot. 8. 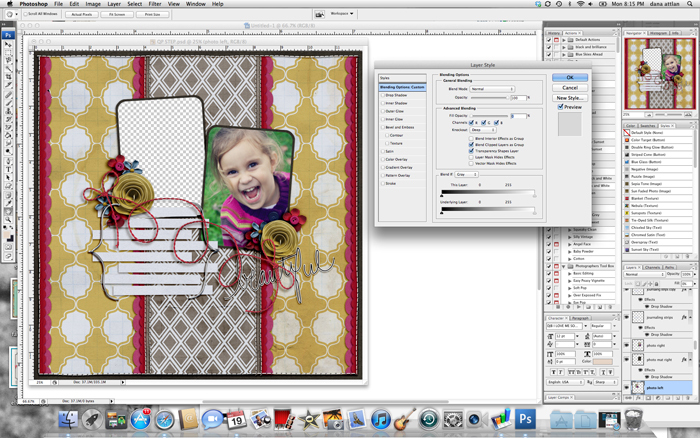 Repeats Steps 2-6 for each photo layer that you have on your original LO until you have deleted all of the original photo spots. 9. Merge the remaining layers together. 10. Save your QP as a PNG file, and you are done!